Why go to a mini-storage when we can come to you? 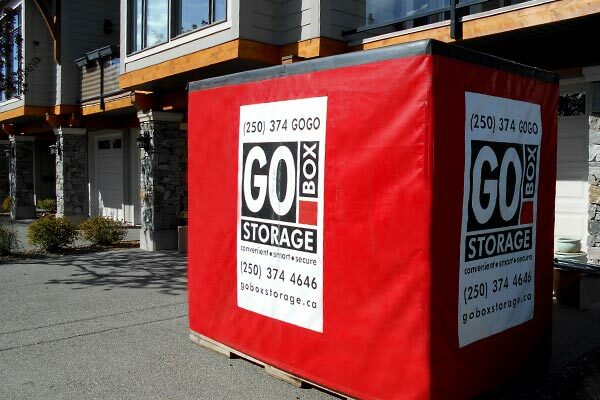 GO BOX Storage delivers storage containers right to your door. We place the GOBOXES where it is safe and convenient for you to load them. GOBOXES are designed to be driveway and neighbourhood friendly. How many GOBOXES will I need? How big is a GOBOX? Part of the stress of moving is trying to squeeze the full time job of packing into your already full schedule. Using GOBOXES can give you the time you need to sort through your things and only pack what you want to move. You pack your possessions only once. 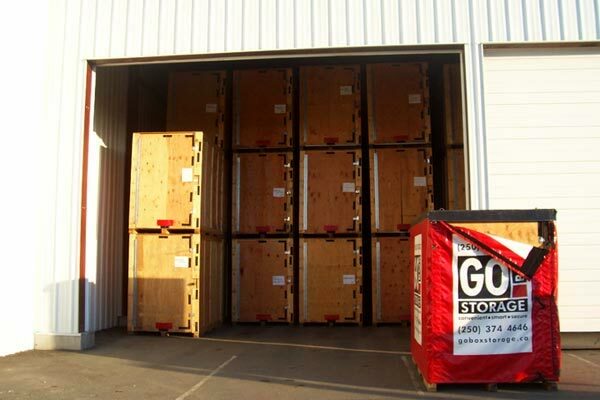 Unlike a traditional mini-storage, there’s no loading and unloading or repeated trips to the storage facility. How to pack a GOBOX? GO BOX Storage can move you directly to your new home. If you have to wait to get into your new home, we will keep your possessions safe in our warehouse until you're ready to move. You pack your possessions only once. 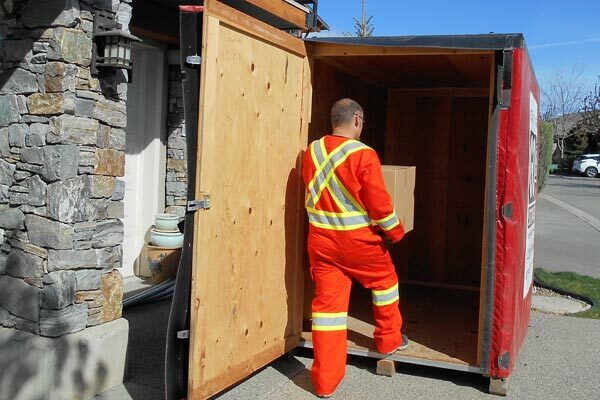 Unlike a traditional mini-storage, there’s no loading and unloading or repeated trips to the storage facility. There is no public access to the storage facility and only you can access your GOBOX. You can get access to your GOBOX by calling or emailing us the day before as our facility is completely fenced and gated. We offer heated and unheated warehouse storage, resident on-site managers, and we proactively monitor the site to prevent any problems with pests. The number of GOBOXES people use varies widely. You will only be charged for the storage you actually use. A quick, rough estimate can be made using the tables on this page. If you would like a more precise estimate, use our GOBOX Online Form. One GOBOX can hold 1-1½ rooms of household goods. A GOBOX provides about 240 cubic feet of storage space. GOBOXES can store mattresses up to a king size and standard sized sofas. Be sure to measure your sofa's length to be sure (no longer than 7'10"). GOBOXES have convenient tie-downs inside. They are an ideal size for packing to ensure your household items and furniture won't shift while in transit. 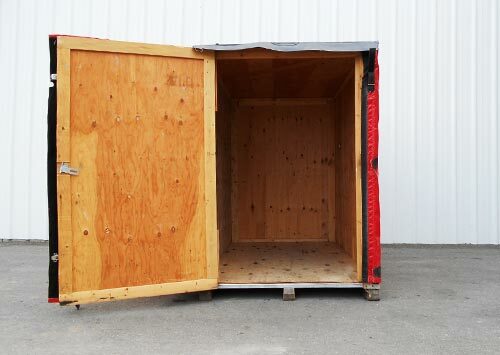 Unlike metal storage containers, our wooden GOBOXES reduce the risk of damage to your possessions from condensation. GOBOXES are ventilated so mold and mildew will not breed in your storage container. "Thank you so much. If not for your service I would have been in a real pickle. I will not hesitate to recommend you to my friends and associates. Your service and care goes beyond the call of duty and I again cannot thank you enough." "Thank you so much for all your care. I haven't seen my belongings yet however my husband and daughter reassured me that everything looks great. :) I will recommend your services to anyone who asks." "Thanks Shaen. It was great doing business with you again and we appreciate the help you gave us at the Vernon end. If you ever want a reference for you and your business don't hesitate to contact us"
"I want to thank you guys. I meant to get cards from Shane. I will definitely use you guys again on my other moves. Thank you so much again." "Thank-you your service was excellent." "Thanks, we saw the truck go by in the front yard, checked the backyard and gobox was removed. Thanks for this service. Very useful!" "We were very pleased with your service all the way through (storage & unloading). We will definitely recommend you to everyone we know. Thanks"
"Great! Thank you as well for your service. We will use you again for sure!" "You are welcome and Thank you for all your service and understanding." "Thank you for everything! I appreciate the convenience and service!" "Thank you. It worked out great." "Thank you to you too! You offer a great service! Cheers!" "It was a very easy way to move and I will let people I know that are moving of my good experience with your company." "Thank you to you too. We really appreciate all your help. It seemed like a “long move” for us because of the early start and all the date changes etc but we are so happy here it was worth it. Thanks." "Thank you, to you both. Not sure what I would have done without you. :)"
Thank you! You provide excellent service!" "Thanks. The boxes really worked well."